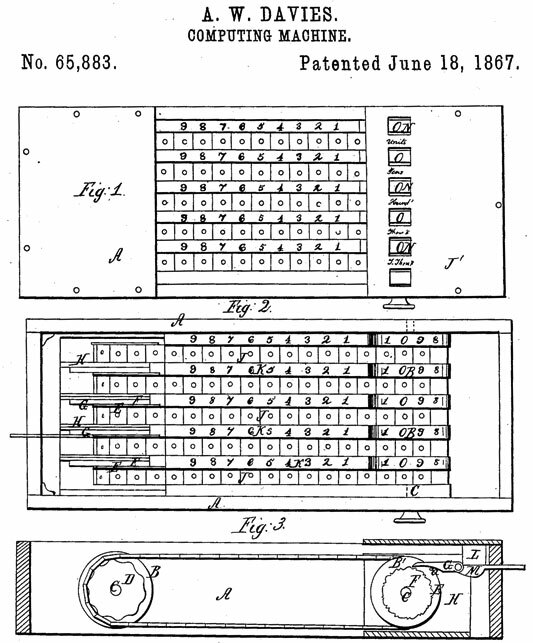 On 18 June, 1867, Alexander Davies from Cleveland, Ohio, received a U.S. Patent 65883 for a slide bar adder, similar to the adding device of George Fowler, patented in 1863. The patent model of the device (see the lower photo) survived to our time and is kept now in the collection of National Museum of American History in Washington, D.C.
Alexander W. Davies (b. around 1837—died on March 14, 1900) lived in Cleveland, Ohio, where he worked as a clerk, car agent, and accountant for several railroad companies between 1863 and 1900. He was a holder of two other US patents (US455197 and US456650) for inventions relating to recording the mileage traveled by railroad cars (car mileage register and report). Let's examine the adding device of Davies, using the patent drawings (see the lower drawings). It was a metal, wood and paper instrument is with overall measurements: 4 cm x 21 cm x 8.7 cm. 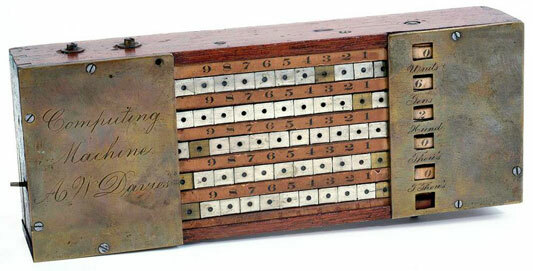 The device has five continuous endless chains (metal bands), thus corresponding with the rows of figures on the board, which are counted from the top downwards, as units, tens, hundreds, thousands, and tens of thousands, as indicated by the lettering between the opening in the right section of the cover or stop-plate J'. The chains move in slots across a wooden frame (marked with A on the patent drawing), passing around the wheels B and B'. Flat pieces of brass cover the top of the frame on the right and the left, keeping the bands in their slots. The chains (bands) are made up of small flat squares of metal, with nine squares silver-colored and the tenth one brass. Each square has a hole at the center for inserting a peg. Strips of paper attached between the bands are numbered from 1 to 9. Moving a band to the right turns the corresponding wheel clockwise. The edge of this wheel, which is covered around the edge with a paper marked with the digits from 0 to 9, is visible through a window in the right piece of brass. The number shown increases as the wheel turns. A lever on the left side disengages (resets) the fourth and fifth columns. The carry mechanism, activated when a wheel passes 9, was implemented by a pawl (marked with G on the patent drawing), attached to a cam (marked with H), which engages in the notches of the wheel next in order, causing this wheel to move the distance of one link, adding one to the higher position.